Auntie Flo - Radio Highlife. Vinyl LP, CD. Bleep. 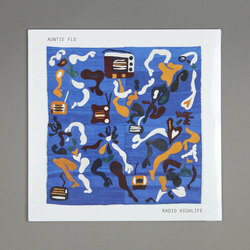 Auntie Flo on Brownswood feels like a natural fit, so it’s a surprise to find out that the Glaswegian producer’s third LP is his first release to drop via Gilles Peterson’s label. Radio Highlife proves to be an extension of Auntie Flo’s Worldwide FM show of the same name. This is a record of globalised dancefloor music that holds rhythm and harmony in perfect balance. Flo’s influences span continents and eras - Afrobeat, Mambo, Norwegian Disco, Kwaito and many other genres all exert pressure on the tunes here. Ably abetted by a supporting cast that includes Yissy Garcia and Golden Teacher’s Laurie Pitt, Auntie Flo coheres these disparate styles into a composite whole with aplomb.